Overall, African dwarf frogs are very easy pets to take care of. But one thing they do need is clean, healthy water. They are very sensitive to water quality. As I've mentioned elsewhere on this site, African dwarf frogs are popular impulse purchases because they're cute and funny. Lots of times people who have never had aquatic pets before buy their frogs on the same day that they set up their habitat, and then they wonder why their frogs die a few days or weeks later. One of the biggest reasons is because the water in a tank for African dwarf frogs (or any aquatic pet habitat) needs to be prepared before the frogs are introduced. If you just fill the tank with tap water and toss the frogs into it, they will almost surely die within a few days or weeks. This page will discuss how to get the water in your tank ready for your frogs and how to keep it clean. You should have your water filter set up. That's where the friendly bacteria will live, so you need to have it set up and running before starting the cycling process. Any substrate or decorations that you want to use should already be installed in the tank. The substrate will serve as a secondary home for the friendly bacteria. It's also a lot easier to work with substrates while the tank is empty. If you will be using underwater lights that need to be attached to the glass or anchored in the substrate, they should already be installed. The air pump, aeration lines, and air stones should already be installed. Aeration will help speed up the cycling process and make the habitat healthier in general. Your tank should already be set up on its stand in its permanent location in your home before adding water to the tank. Aquarium tanks should only be moved when they're empty, never when they contain water. The water pH should be between 6.5 and 7.5. Most tap water falls within this range, but if not, then you should use the appropriate aquarium pH adjuster to bring it within range. In short, you should have the entire habitat all set up (with the exception of the hood or overhead lights, which can come later), before you put a drop of water in the tank. Once all of this work is done, you're ready to add water to your African dwarf frog tank and get the nitrogen cycle started. Well, as simple as something so complex can get, anyway. It's not an easy thing to simplify, but I'll give it a try. The frogs or other animals in the tank produce ammonia in their kidneys and release it into the water. Beneficial (or "friendly") bacteria in the filter and the substrate use the ammonia for food and convert it to nitrites, which are also very toxic to frogs and aquatic creatures. These bacteria belong to the genus Nitrosomonas, especially the specie Nitrosomonas marina. A second group of friendly bacteria convert the nitrates into nitrates, which are also toxic, but much less toxic than nitrites. The bacteria who do this work belong to the genera Nitrobacter and Nitrospira. The Nitrospira are much better at it than the Nitrobacter are, but they take much longer to populate a new aquarium. The nitrates are removed from the aquarium by water changes (and by live plants in the water if there are any). This process usually takes between two weeks and two months to happen. During that time, the aquarium is considered to be "cycling." 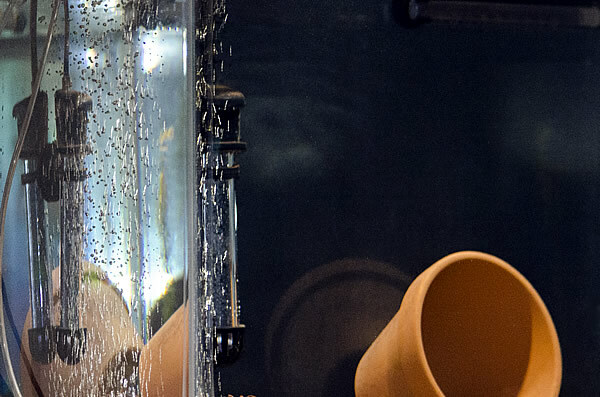 Once the process completes and is self-sustaining, the aquarium is considered "cycled" or "fully-cycled." Please note that even in a fully-cycled tank, there are no bacteria who can digest the nitrates. 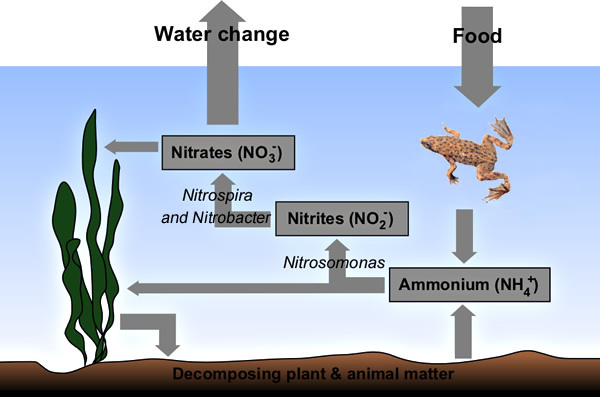 Nitrates are the end product of the cycle and are removed by water changes (and live plants, if you choose to add them). You must continue doing water changes for as long as you have your aquarium. Plants will reduce the frequency, but not completely eliminate the need for water changes because there are also other water changes that occur that require changes. A good rule of thumb is to change 20 percent of the water in the tank once every week, or more often if your test results for ammonia, nitrite, and nitrate are more than 0, 0, and 20 ppm respectively. Once your tank has cycled, the parameter that will most often be high is the nitrates, which should never under any circumstances be allowed to get over 40 ppm, so shoot for a goal of less than 20 ppm. If you use municipal water, you will have to dechlorinate it before you use any of the methods below you start the cycling process. Almost all municipal water supplies contain chlorine. Some also contain chloramine, which is a compound of chlorine and ammonia. Either chemical is toxic to fish and to the friendly bacteria that we need to get the cycling process underway. Chlorine (but not chloramine) can be removed from tap water simply by letting it sit for 48 hours, or 24 hours if the tank is strongly aerated during the process. If you're absolutely, positively, one hundred percent certain that your tap water only contains chlorine and not chloramine, then all you have to do is let the tank sit for a day (with strong aeration) or two days (without aeration). If you're not absolutely certain that your water is free of chloramine, or if you just want to speed up the dechlorination process, you will have to use an aquarium dechlorinator such as Seachem Prime, API Tap Water Conditioner or Tetra AquaSafe PLUS Water Treatment. Any of those products will remove both chlorine and chloramine from your tank, among other helpful things that they do. If you get your water from your own well or spring and you don't add chlorine or chloramine, then you don't need to dechlorinate it at all. You can also skip the dechlorination step if you use a tap water filter that removes both chlorine and chloramine for your drinking water. Most home water filters remove chlorine, but not all of them remove chloramine. Check with the filter's manufacturer if you're not sure. If you already have or have access to another freshwater frog, fish, or turtle habitat that is healthy and fully-cycled, you can simply borrow some bacteria from that tank (which we'll call the "donor tank") and "transplant" them to the new tank (which we'll call the "recipient tank"). There are four easy ways to do this. Whichever one you choose, try to keep the time between when the bacteria are removed from the donor tank and when they are introduced to the recipient tank less than half an hour. 1. Borrow some Filter Media from the Donor Tank. You can quickly get your new tank cycled by taking some filter media from the donor tank and transferring it to the recipient tank. Because filters used for African dwarf frogs are usually small in size, the easiest way to do this may be to bring the empty filter for the recipient tank to the donor tank's location, transfer the media from the donor tank's filter to the recipient filter, add enough water from the donor tank to cover the media in the recipient tank's filter, and carry it home right away, being careful not to spill it. Then immediately install the filter on the recipient tank when you get home. You can also carry the media from the donor tank's location to the recipient tank's location in a bucket containing the media and enough water from the donor tank to completely cover it. If it's going to take longer than half an hour to make the trip, then aerate the media using a battery-powered aquarium air pump during the trip. Don't take more than half the media from the donor filter. That's about as much media loss as a mature filter can tolerate. If possible, add extra bagged media like ceramic rings to the donor filter about two weeks in advance, and then remove only that media for transplant to the recipient filter. 2. Borrow some Substrate Gravel from the Donor Tank. An easier but much less-reliable way to transplant friendly bacteria to your new tank is to take some substrate gravel from the donor tank and install it in the recipient tank. Ideally, the donor tank will use the same substrate as you plan to use in the recipient tank if you use this method. Transport the substrate in a bucket with enough water from the donor tank to cover it, and aerate it during the trip if it's going to take more than half an hour. 3. Use the Dirty Water in the Donor Tank's Filter Canister. If the donor tank uses a canister filter, then there will be a layer of gunk and some dirty water in the filter canister. You can pour that gunk into your new tank's filter, install the media that came with the filter, and fill it the rest of the way with water from the donor tank. Within a few days, the media in your new filter should be populated with friendly bacteria. Again, try to keep the total time from adding the gunk and water to installing the filter in the new tank to a half-hour or less. 4. Install the New Filter on the Donor Tank for a Few Weeks. If you're in no hurry, then simply install the new filter on a healthy and fully-cycled donor tank and let it run for two or three weeks. During this time, any UV filters installed on both the donor tank and the new filter should be turned off to allow the bacteria to get into and populate your new filter. This method takes longer than the others, but it's easier and usually works very well. This is the simplest method, but it takes the longest time. It can take up to two months for the cycle to complete using this method, although three or four weeks is more common. You will need some fish or frog food and either a freshwater aquarium water test kit or freshwater aquarium water test strips to use this method. The way this is done is by filling the tank with water and starting the filter, heater, and aeration if the tank is so equipped (which it should be). If there is a UV sterilizer in the system, turn it off and leave it off for the duration of the initial cycling. Add some fish or frog food to the tank, wait a day, and test the ammonia level. It should be high because the food that you added will be decaying and releasing ammonia into the water, which is what you need to get the cycle started. What you're shooting for is 3 to 5 ppm (parts per-million) or higher. If it's not that high, then add a bit more food, wait another day, and test it again, adding a bit more food if needed. Continuing testing it every morning at about the same time, adding more food to try to keep the ammonia level close to 3 ppm. At some point, you should start getting very low ammonia test results. That will mean that the Nitrosomonas bacteria have become established and are converting the ammonia into nitrite. When that happens, start checking the nitrite levels every day in addition to the ammonia levels, continuing to add a bit of food every day. You need to keep creating ammonia to feed the Nitrosomonas bacteria or else the process will stall. After a few days to a week or more, you should start seeing the nitrite levels dropping. When that starts happening, it means that the Nitrobacter and possibly the Nitrospira bacteria are starting to become established. When that happens, start checking the nitrate levels every day, in addition to the ammonia and nitrite levels. When the ammonia level and nitrite levels in the morning are either zero or trace (less than 0.25 ppm for ammonia and less than 0.5 ppm for nitrite), start doing partial water changes until your morning water tests are consistently showing zero ammonia, zero nitrite, and 20 ppm or less nitrate. At this point your tank may not be completely cycled because it takes the Nitrospira bacteria a while to get up to speed, but it will be safe to introduce your frogs. Keep checking the ammonia, nitrite, and nitrate levels every day for a few weeks until you're sure that the tank is stable, and at least twice a week thereafter, doing partial water changes weekly, or more often if needed, to keep the ammonia and nitrites at zero and the nitrates under 20 ppm. If you need or want to speed up the cycling process to make your tank safe for your frogs, you can use a commercial startup supplement to jump-start the process. These supplements usually contain enough Nitrosomonas and Nitrobacter bacteria to get the process started, but usually don't contain Nitrospira bacteria. They won't really get your tank immediately cycled, but they'll jump-start the process and flatten out the chemical spikes, making it safe to introduce your frogs while the process continues to run its course. The two startup bacteria supplements that I recommend for small freshwater habitats are Tetra SafeStart or API Quick Start. They're both good products, and either one usually works if used according to the label instructions. Once in a while, though, you'll get a dead bottle. That usually means either that it's past its expiration date, or that it was kept in a hot trailer that was parked out in the sun for a few days while it was being shipped. It doesn't happen very often, but it happens often enough that I suggest that you wait a day between adding the supplement and introducing the frogs. Add the supplement, and then add a bit of frog or fish food to create a little ammonia, let it sit overnight, and test the water chemistry the next day. If all is well, then you're good to go. If not, then probably you got a dead bottle. Ask the vendor for a replacement or call the manufacturer. If you use this method, be aware that your tank isn't fully-cycled. That will take as long or longer than if you hadn't used the supplement. So keep checking the water chemistry every day for at least six weeks. If all is well at the end of that period, then you can consider your tank cycled and reduce your testing frequency to twice a week. Once the water in your frogs' habitat is fully cycled, maintaining it is very easy. Here are the things you need to do to keep it clean and odor-free. Check the water chemistry twice a week. If something is off, it's a clue that there could be a problem. Don't overfeed. Remove uneaten food within half an hour of putting it in the tank. Overfeeding and not removing uneaten food are the most common causes of poor water quality. If a frog or other resident of the tank dies, remove its body immediately, wrap it in a paper towel, and dispose of it in the trash. If you use live plants, promptly remove any leaves that have died or fallen off. Using a substrate will generally help water quality, but only if you vacuum it regularly with an aquarium vacuum cleaner. If you replace 20 percent or more of the water while vacuuming, then you can also consider it a water change. Consider using ghost shrimp as cleaning helpers. Be aware that they will eventually become frog food, however. Whether this happens before or after the shrimp die of natural causes is anyone's guess. Choosing larger ones will reduce the chances of their being eaten alive, but also means they have less natural life left. Do a 20 percent water change once a week or any time the ammonia or nitrites are higher than zero or the nitrates higher the 20 ppm. Using an aquarium water-change kit makes it easier, but buckets work, too. Properly maintain your filter. Rinse reusable media such as sponges, Bio Balls, or ceramic filter media in tank water, not tap water. Don't use soaps or detergents to clean your filter or media. How often you need to service your filter depends on its capacity (larger filters need servicing less often). If you notice a marked decrease in flow, then your filter is past due for maintenance. If you make sure to follow the above advice, you should very rarely have any water-quality or odor problems in your African dwarf frog tank.